(CBS News) Stop counting those calories: Restricting your diet may not help you live longer after all. 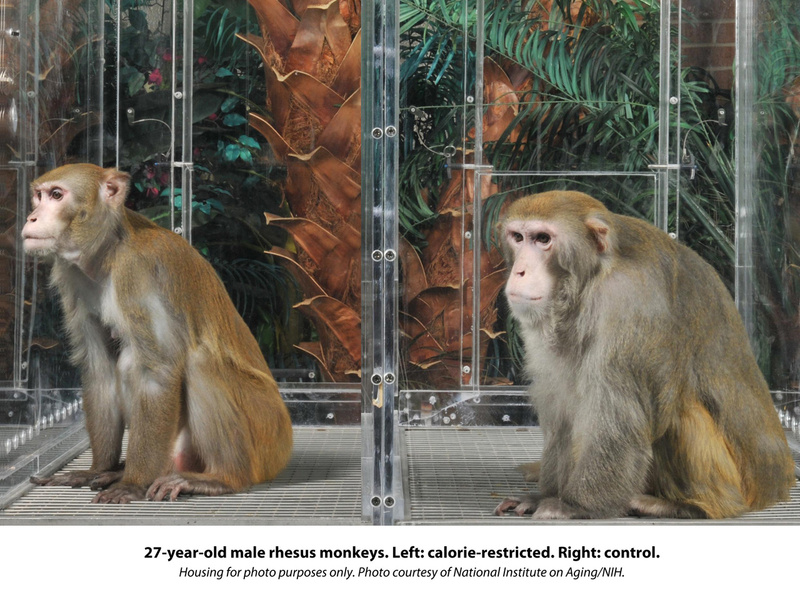 A 23-year study by the National Institute on Aging shows that calorie-restricted rhesus monkeys - which have a similar genetic code, median lifespan and physiology to humans - didn't live any longer than monkeys who ate a heavier diet. "One thing that's becoming clear is that calorie restriction is not a Holy Grail for extending the life span of everything that walks on earth," lead author Rafael de Cabo, an experimental gerontologist at the U.S. National Institute on Aging (NIA) in Baltimore, Md., said to the Wall Street Journal. Previous research has shown that calorie restriction has helped animals including rats, mice, yeast, fruit flies and round worms live 30 to 50 percent longer. In these cases, caloric intake was reduced by 10 to 40 percent compared to other creatures that were allowed to eat as much as they want. Then, a landmark study published in 2009 from the University of Wisconsin showed that reducing calories in the diet of rhesus monkeys over a 20 year period helped extend their lives. Only 13 percent of the monkeys of a diet died because of age-related instances, compared to 37 percent of the monkeys who could eat whatever they wanted. In the new study, 121 monkeys split into a group between the ages of 1 to 14 and another group between the ages of 16 to 23 were either fed a normal diet or a diet that was 30 percent fewer calories than their normal diet. By 2006, the calorie-restricted monkeys had seemingly younger immune systems and were less likely to get heart disease, diabetes, cancer and other diseases of aging. But, at the end of the study, the oldest animals had the same amount of tumors, heart disease and overall decline in health as the group that was allowed to eat more. The monkeys who had caloric restriction starting in the earlier period of life didn't live longer, with scientists calculating that the probability that they would outlive their peers who had more to eat at .1 percent. The young restricted diet group were also more likely to die of causes not related to aging than the other group. They did have less incidence of cancer, however. As for the group that started eating fewer calories later in life, they did show lower levels of triglycerides, which have been linked to heart disease risk. But, neither calorie-restricted group lived longer. Scientists believe several factors allowed the Wisconsin monkeys to live longer, according to a Nature blog post. First, the Wisconsin monkeys had seven times the table sugar - about 28 percent of calories, similar to an average American's diet - than the NIA monkeys. The Wisconsin monkeys that were not calorie restricted were also allowed to eat as much as they wanted to, meaning they could have eaten themselves to death. The NIA monkeys who had the higher caloric diet were eating closer to a normal diet, but were considerably lighter than the Wisconsin monkeys. Also, in the NIA study, the monkeys were from India and China accounting for more genetic variety, where the Wisconsin monkeys were only from India. "This shows the importance of replication in science," Steven Austad, interim director of the Barshop Institute for Longevity and Aging Studies at the University of Texas Health Science Center in San Antonio, told the New York Times. He wrote an accompanying article to the NIA research. He added to the Wall Street Journal that both studies looked scientifically sound. But some people say that the new evidence against cutting calories won't stop many from restricting their diets. Brian Delaney, president of Calorie Restriction Society International, told the Wall Street Journal that counting calories makes the society's members feel better. "They see their blood pressure go down, their fasting glucose go down, their cholesterol go down, and they feel better," Delaney said. "They believe it will enable them to live youthfully into their 70s, 80s and even 90s." And, Mark Mattson, chief of the laboratory of neurosciences at the National Institute on Aging, still skips breakfast and lunch on weekdays and breakfast on weekends, according to the New York Times. He was not involved in the NIA study. He believes that it helps the brain, makes people healthier and live longer - despite his organization's research. "I get a little hungry," he admitted. "But we think being hungry is actually good." The study was published on Aug. 29 in Nature.